The Log House Retreat is charming with a century old history based on its original log Great Room. While fully maintaining the charm of its history, the Log House has been brought into current times with all the modern conveniences. Log House Retreat is the new sister property of 2 Bedroom Valerian Retreat - winner of over 100 five star reviews (VRBO # 462086) and 3 Bedroom Cottage retreat - winner of over 60 Five Star Reviews (VRBO # 754978). Rent one alone or, as others have discovered, rent some combination of these cabins located near each other for a perfect family reunion or get together of friends. In the cabin you’ll find all the amenities you will need in this newly renovated (September 2017) 2 bedroom cozy cabin with 2 baths. When you walk into the Log House, you won't find the musty stuffiness, typical of many vacation rentals. It is fresh and clean with a pleasing blend of new vintage and contemporary furnishings. The modern kitchen has all new solid stone surface counters and is decorated to look and feel like an old style farm house. The cabin decor is professionally done to feel comfy with great function. There are 3 flat screen TV's, free Wi-Fi and some cell services that work well (Verizon has been two or more bars). Complimentary Netflix movies are provided. The cabin can sleep 6 comfortably with central air conditioning and heating. The outside area is large and level, making it a great place for kids to play, ride bikes and explore nearby. The living room, dining area and kitchen are all open, allowing you to enjoy watching your favorite movies or shows and to stay warm with the original stone hearth fireplace in those cooler months. There is also central air-conditioning and heat for your comfort any time of the year (a rare, desirable feature in such a rustic home, as opposed to the typical noisy bedroom wall units). You'll also find a fully equipped interior laundry room. Natural materials were used to accent the home’s history lending to its warmth and the charm of times gone by. Look and you’ll see features in the home that are nearly 100 years old. Set on 40 acres, the property will invite you to take leisurely hikes and enjoy the forested and scenic views. You can see the Sierras from locations on the property. Peace and quiet are the best things you’ll notice when you stay at the Log House Retreat. It is set back just off the main route 49, near the historic town of Mariposa and is half way between two entrances to Yosemite Park. You’ll want to sample both easy but different drives into Yosemite - either via the west entrance with HWY 140 along the valley floor beside the Merced River or via the south entrance with HWY 41 through the Sierra mountains. This location is a great place to retreat to after a busy day with the crowds of summer in Yosemite. The cabin is also a great hideaway in the fall, winter and spring. As the temperature drops, the property, with its special setting, may welcome you with a beautiful snowscape. Come and visit! You won’t want to leave. Go north on route 49 to reach the arch rock highway 140 entrance that takes you through the historic town of Mariposa and along the valley floor of the scenic Merced River canyon. It is a beautiful drive which will take you about 45 minutes to an hour to reach the park. There are many places along the road to stop and enjoy the wild and scenic river. This area is known for spectacular wild flower viewing. Go south on route 49 to reach Oakhurst - a larger town with many services, dining and shopping options. In Oakhurst, you will turn left onto highway 41 east to wind your way up the mountain into Yosemite Park through the quaint little villages of Fish Camp and Wawona – both places of many interests. Near Wawona is the must see Mariposa Grove of giant redwoods. As you drive further toward Yosemite just after the tunnel, be sure to pull off to see the spectacular view of the Yosemite valley from above. 3. Bass lake is located fifteen minutes from Oakhurst. It is a hopping place during warm weather for water sports and just catching some sun and a picnic for the day. Bass lake offers water sports rentals, shops, casual as well as fine dining options. 'Ducey's on the Lake' is a favorite restaurant. 4. There are 3 local golf courses just minutes away: Sierra Meadows, River Creek and Wawona; the latter is just inside Yosemite. 5. During the winter months you can travel to Badger Pass to enjoy downhill and cross-country skiing and snowshoeing. 6. Many of the communities have many other activities throughout the year! On local websites you can find events like festivals, the arts and wineries to explore. Mariposa has a zip line and river rafting in the summer, as well as horseback riding on forested trails. 7. Mariposa has its own airport just 10 minutes from town and 20 minutes from the cabin. Car rentals are available at the airport with advance reservations. 8. Fresno international Airport is about 1 hour and 15 minute drive to the cabin. Log House Retreat is owned by Cottage Retreats LLC. I was brought up on the east coast with four seasons. Later moving to California to work as a physician, I had the good fortune to travel to Mariposa and Yosemite during the winter season to find a truly unique splendor. I decided that this was the ideal place to go for rest, while getting back in touch with nature. This property is unique as it sits so quietly and privately surrounded by 40 acres of forest and fields at 3200 feet. Yet easily accessible from Route 49 only a mile away. Bring a book and get ready to enjoy the peace and rustic beauty of your surroundings. Ready to take a walk? No need to go looking elsewhere, when you are ready to explore nature. You'll find carved paths traversing the property's 40 acres. 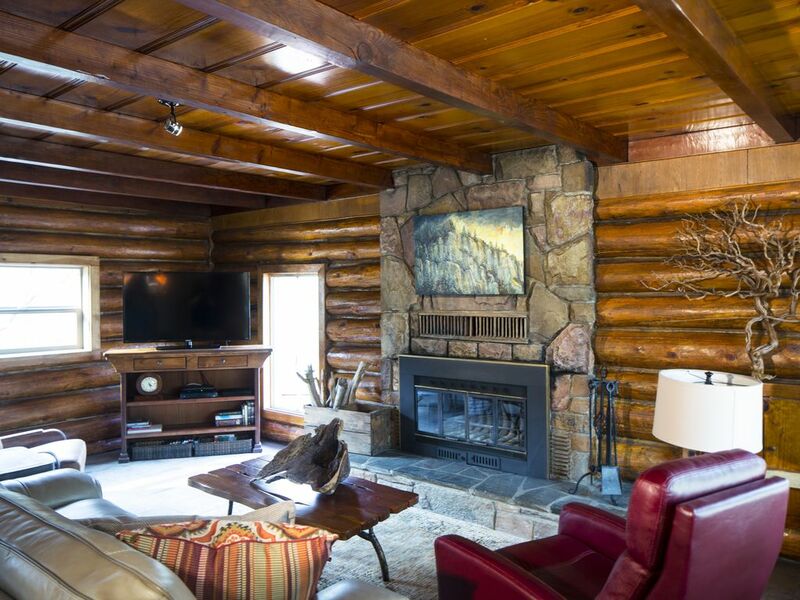 This home will take you back a century with the original log house design elements and redone materials, while maintaining up-to-date conveniences. Private quiet rustic setting among oaks and pines, yet only one mile from the main thoroughfare leading to Yosemite's entrance roads. Peaceful, relaxing, beautiful, everything is up to date, immaculate. Abundant wild life to see. The stars are so amazing. Two nights was rejuvenating, three would be better. The log cabin was so nice. The log livingroom is dramatic, beautiful and comfortable. The kitchen and dining area are very elegant. The bedrooms were cozy and comfortable. The bathrooms were modern and clean. The fire pit was very nice. And the barbeque worked great. The entire place was stocked well and clean inside and out. This place was amazing! Ted and his team provided everything we needed for a relaxing weekend away. We loved hiking the property with our dog, drinking whiskey by the fireplace and waking up to snow every morning. We will definitely be returning! We really enjoyed our stay. Cabin is beautiful, immaculate and well thought out. So refreshing to rent a place that isn't all pieced together. Property was quiet and wonderful to walk around on. Would definitely stay here again. A perfect getaway at the base of the Sierras. About an hour outside of Yosemite this cabin is perfectly appointed an excellent stay for two couples or a family of four or five every night we were able to view a multitude of stars in the black sky. Ted was a great host as well. He answered all of our questions and made sure that we had plenty of everything we would need. Just can’t say enough good things about this place. We had a great time. Truely a 5 star cabin to unwind and unplug.